Grass sponges are comprised of a simple cellular structure with only two tissue layers. Spongin provide support for the organism. They possess no organs, but are able to draw water into their bodies through the use of ciliated cells in order to entrap food. Reproduction can either be sexual or asexual depending on environmental conditions. Grass sponges can be found off the coast of Florida and the West Indies. 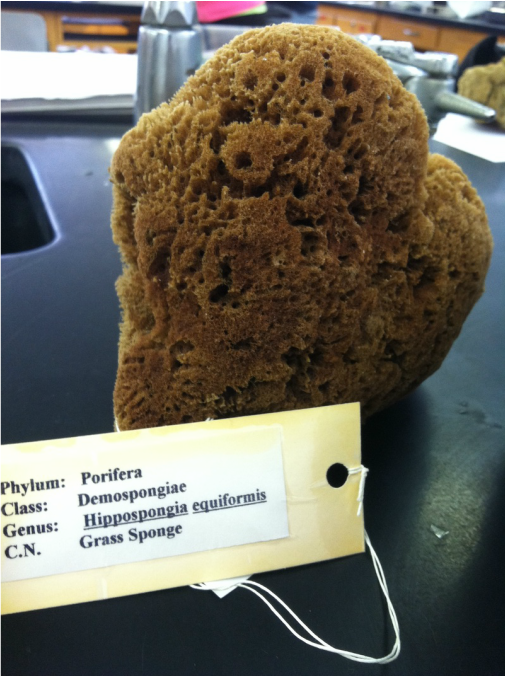 The Grass sponge is a species that was used extensively for as cleaning and bathing instruments for humans. Since the development of synthetic, their commercial value has decreased slightly. They are also used by artists and painters as an alternative to standard paint brushes. Kelly, Cynthia D. et. al. "Grass Sponge". Florida State University. Retrieved from: http://micro.magnet.fsu.edu/optics/olympusmicd/galleries/reflected/grasssponge1.html.